Alpha Performance Carbon Fiber Induction Kit MERCEDES-BENZ - Dezod Motorsports Inc - Home of the automotive performance enthusiast since 2002. 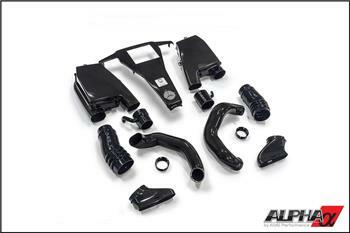 Lightweight and aesthetically appealing, the Alpha Performance Carbon Fiber Induction Kit is also the most efficient choice you have for improving the air intake of your vehicle. It was designed, first and foremost, to improve performance and power production while offering a beautiful quality finish to truly complement your stock or upgraded engine. Our engineers discovered a significant pressure drop in the intake ducting located after the stock air filter box – a telltale indication that the OEM system was not performing efficiently. To improve air flow and eliminate restrictions, the process of designing a set of higher volume air filter boxes, filters and piping began with a CMM scan to determine the best use of space within the tight confines of the engine bay. With that data, a CAD design was developed and taken to a working prototype. The results confirmed our suspicions and rewarded us with HUGE power gains! Unlike other intakes in the market, we redesigned the entire intake system – not just the air filters or the filter lid. It is considerably larger and makes more power than the competition and provides your vehicle with improved air flow dynamics for greater efficiency and maximum output! By using full carbon fiber construction, the air boxes, inlets and tubing are incredibly strong, lightweight and look great. In addition, we supply wire reinforced, custom molded silicone couplers for durability and function. While other air box options are available, the Alpha Carbon Boxes offer far superior performance and are the last ones you’ll ever need to buy. Rather than requiring replacement, if you decide on larger turbos down the road, our engineering team designed an innovative coupling sleeve. This allows you to transition from stock to upgraded turbos if you so choose – making this truly a one-time purchase. You have the option of either trimming your factory cover or complementing your new intake with our matching carbon fiber center cover. Provisions have been made to transfer the emblems and the name plates for a unique yet factory appearance which will wow anyone peering under your hood.